Camilles Sue enlisted in the 8th Australian Light Horse Regiment under the name Wallace Essay; he died at Gallipoli 7 Aug 1815. (Yes, the Light Horse served at Gallipoli, without their horses). His father was George Sue, a well-known Chinese hawker in Wentworth, NSW, his mother was English; he was born in Wentworth. I have wondered at the choice of his unusual pseudonym given that there is exactly one ‘Essay’ in the White Pages for Australia. It has occurred to me that maybe it is ‘SA’ = South Australia. I’ve not been able to find any connection between the Sue family and South Australia, but the Wentworth area was primarily settled by people coming up the Murray from South Australia and many Chinese got to the Victorian goldfields via South Australia. 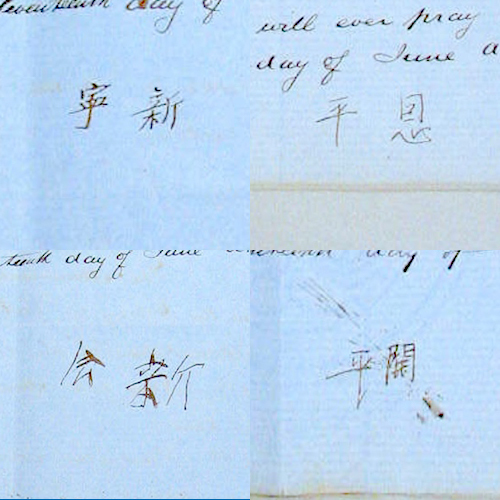 Camilles enlisted in Victoria, perhaps he was rejected in Wentworth, where everyone knew his father was Chinese. It’s not unknown for people to adopt names based on their birthplace or other associated place: Dame Nellie Melba, for example. A friend of mine, after a couple of marriages, changed her name to the town in England where she was born. Thanks Geoff. I’ve already downloaded his service record and been in touch with other members of the family. But no explanation of the origin of his pseudonym!